This rugged, undeveloped wilderness park is located on northern Vancouver Island, south of the community of Woss and north of Zeballos. One of the most pristine wilderness parks on the Island, the landscape includes the southern portion of Woss Lake, as well as very steep forested slopes above the lake and the permanent snowfields and north facing slopes of Rugged Mountain, part of the Haihte Range. There are no recreation facilities in Woss Lake Provincial Park, but adventurous visitors with a boat, canoe or kayak can enjoy various activities ranging from backcountry hiking, skiing and mountaineering to camping, fishing, First Nations and nature appreciation and hunting. Special Features: Woss Lake Provincial Park is home to a picturesque waterfall, which can be viewed at the south end of Woss Lake looking southwest toward the Tahsis divide. This waterfall cascades a few hundred meters into a creek that flows into the lake. This park contains few developed facilities. There are a few wooden tent pads at the south end of the lake, as well as a composting toilet and shelter which were installed by the Namgis First Nation. This park is a wilderness area that is not regularly serviced or patrolled. Please practice “Leave No Trace” camping and day-use in the area. The nearest phone, store and tourist info centre is located in the town of Zeballos. The park is situated south of the community of Woss on northern Vancouver Island. Access to the park is generally by boat from a launch at the north end of Woss Lake. Walk-in access to the northern portion of the park is possible from logging roads on either side of Woss Lake. Access to Rugged Mountain is through a steep and strenuous hike from logging roads outside the park in the vicinity of Zeballos Lake to the west. History: Woss Lake Provincial Park was created in 1995 as part of the Vancouver Island Land-Use Plan. Cultural Heritage: Woss Lake Provincial Park is within the traditional territory of the Namgis First Nation. The park contains a portion of a First Nations traditional cross-island trade route known as the Grease Trail, which made its way over the Tahsis divide. Culturally modified trees (CMTs) have been identified in the park. 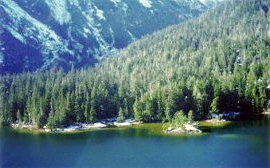 Conservation: Woss Lake Provincial Park is a very steep, forested, seldom visited wilderness area. The park contains Roosevelt elk populations, a salmon fishery and potentially, habitat for the endangered Vancouver Island marmot. The park also contains a nameless, intact secondary watershed of 1,600 hectares that drains into the head of Woss Lake. This unnamed drainage contains valuable Chinook salmon and steelhead spawning habitat and a sensitive delta area with a variety of rare plant species. It also protects representative old-growth forest landscapes, a complete watershed of a major tributary at the south end of Woss Lake, and is dominated by Rugged Mountain and the glaciers and snowfields of its north-facing slopes. The pristine old growth forested slopes above Woss Lake and the scenery offered by Rugged Mountain and its glaciers – the largest on Vancouver Island – are of provincial significance. Approved Management Direction Statement [PDF 1.9MB] for Woss Lake Provincial Park is available online in pdf format. Woss Lake is suitable for kayaking and canoeing. Approximately half of this lake (8 km) lies within the park boundary. Rugged Mountain is known for its alpine climbing, however access is difficult. Opportunities for fresh water fishing exist within the park on Woss Lake. All anglers should check the current regulations issued by Fisheries and Oceans Canada prior to fishing. Anyone fishing or angling in British Columbia must have an appropriate licence. Pets/domestic animals must be on a leash and under control all times. You are responsible for their behaviour and must dispose of their excrement. Backcountry areas are not suitable for dogs or other pets due to wildlife issues and the potential for problems with bears. Backcountry areas are not suitable for dogs or other pets due to wildlife issues and the potential for problems with bears. There is no designated swimming area at Woss Lake. There are no lifeguards on duty at provincial parks. This park offers opportunities for backcountry skiing/ski mountaineering. One popular destination for this activity is Rugged Mountain. Access to Rugged Mountain is through a steep and strenuous hike from logging roads outside the park in the vicinity of Zeballos Lake to the west. The other area suitable for this activity is on the southeast end of the park in the vicinity of Woss Mountain. This area is accessed by Western Forest Products logging roads along the east side of Woss Lake, outside of the park. There is a composting toilet in this park. There are no designated campsites at this park, however random wilderness camping is allowed. All sites are on a first-come, first-serve basis and no facilities are provided. Please practice “Leave No Trace” camping ethics. Woss Lake Provincial Park is open year-round; there is no fee for winter backcountry camping.